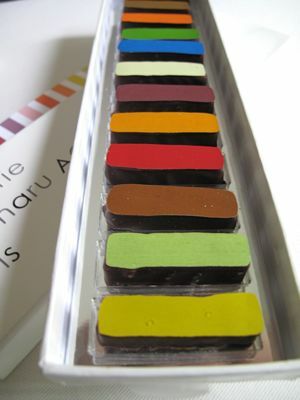 From the patisserie Sadaharu Aoki, with several branches in Paris and a couple in Tokyo, these are the single most stunningly colored chocolates I have EVER laid my eyes on. Aoki has lived in Paris for much of the last two decades and if David Lebovitz considers him one of the best pastry chefs in Paris, you just have to give him a try. The chocolates were a visual treat, I didn’t want to eat them, but when I finally popped one in my mouth it was a dark thin shell encasing some delicious ganache. I don’t think the colors denote flavors in any way, they just seem to be there for visual impact. If you wish to know more about Mr. Aoki, try this link. It is nice to be remembered, but delightful to be remembered thoughtfully. Those paperclips and keychain are absolutely the cutest! The Japanese certainly know cute. 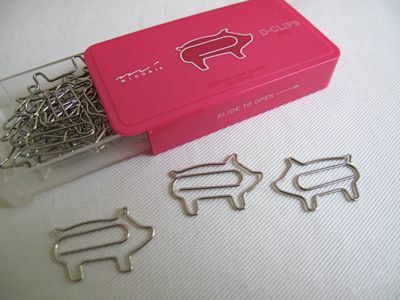 darn, they are so cute.. i would probably stare at the chocolates forever..atleast i would not gain calories from that.. hehehe.very nice indeed..
the pig clips are so cute! Awesome!!! One of the traits I admire with the japanese is their passion for perfection. I believe they bring passion up to the level of obession. And I miss working in a chocolate shop!!!! the Japanese have so much cool stuff, their “inventiveness” delights me whenever I’m there. I do love their packaging I just feel it’s too much sometimes… landfills come to mind. :) How could I have missed those chocolates? Beautiful! Cool items. 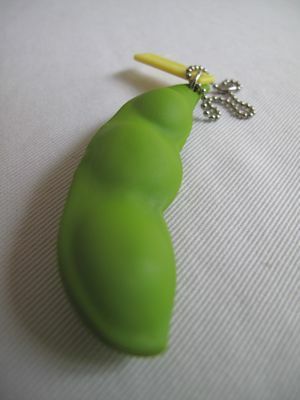 :) I especially like the edamame key chain. MM, …..and even the way the japanese wrap the box!!! OVER!!! My immediate thought when I saw the first picture was –xylophone! these gifts are sooo cool! love, love, love it!!! i wish i have pasalubongs these lovely for my family and friends when i go home this june. I know what you mean about pasalubong…now I just buy something when I see something nice that I know the person will appreciate. 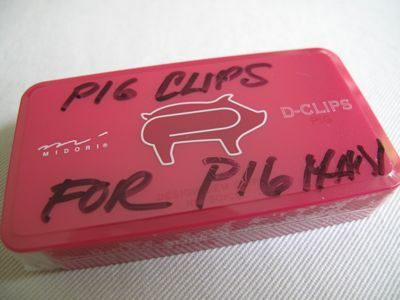 “Pig Clips for PigMan” = nice! 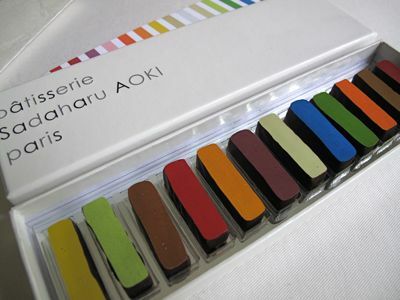 Aoki makes my heart skip a beat. Without reading this post, I knew straight away what that was. I do love his macarons also but it was his chocolate that stole the show for me. He is art. Sadaharuâ€™s chocolate ganache has a mirror finish and stay beautiful even in a roaring 100-degree temperature. Japanese pride themselves with their gift wrapping and packaging. It is an art to them. Look at their Ikebana arrangement only a handful of flowers and has all the elements of a good visual perfection right in there. cute stuff! discovered aoki a few yrs ago when he opened his tea house/patisserie in the 6eme. his take on traditional french pastries isn’t as visually sharp but the flavors are so unique. favorites duomo macha azuki, black sesame eclairs & flan sesame eclairs make great presents and dinner treat(have turned on quite a few frenchies who had been unfamiliar with aoki). best part is that the pastries are NOT cloyingly sweet. never went back to p. herme after..
whare can you buy ROYCE chocolates in the US or Canada?? thanks..
those are chocolates??? I would have used them as paint by mistake :-D! Neat!!! Cool gifts! You’re neighbors thinks of everything with style to give you such thoughtful gifts. 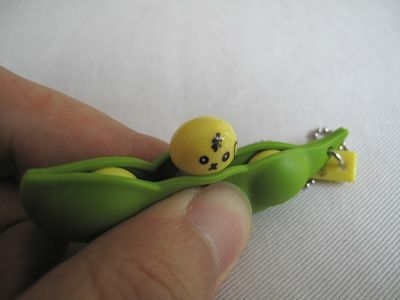 The edamame key chain is cute. Seems like a lot of work and thought was put into making such a tiny thing. Great neighbor. You’re a good apple….that’s why you got good pasalubong…Envious? I…yes sireeee…. You deserve it since you do so much for everyone. I think the cutest are those Japanese bento boxes and accessories! I agree about the packaging & Japanese origami papers!